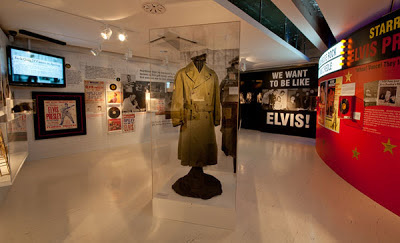 Having attracted in excess of 125,000 visitors since its opening in 2011, Liverpool’s 'Elvis and Us' exhibition is to extend its stay in the city through to 2014 – a year longer than originally planned. And to celebrate this success, Graceland’s official curator Angie Marchese was in town on Monday June 17th bringing even more artefacts all the way from Memphis to include in the exhibition. Co-curated by Graceland and Liverpool's award-winning Beatles Story attraction, the 'Elvis and Us' exhibition uses artefacts – most of which have never been seen outside of Graceland before - and multimedia to explore the huge influence The King of Rock 'n' Roll® had on the Fab Four. Formally opened in October 2011 by Jack Soden - president of Elvis Presley Enterprises - 'Elvis and Us' has wowed thousands of Elvis and Beatles fans alike. 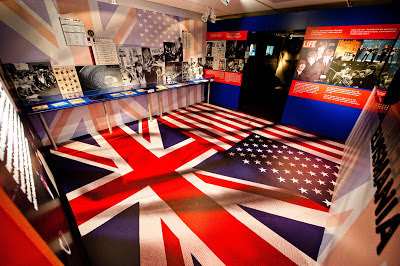 Centring around the historic meeting between The Beatles and Elvis at The King's Bel Air mansion on August 27th 1965, the exhibition collects artefacts from Elvis's childhood through to his spectacular Vegas years, and even includes the bass guitar Elvis used to jam with The Beatles! There are exclusive video interviews with those present at the meeting between Elvis and The Beatles including Priscilla Presley, NME journalist Chris Hutchins and The Beatles PR guru Tony Barrow. The insights given by the interviewees are incisive and often surprising. In addition original Beatle Pete Best and The Quarrymen are interviewed about the influence of Elvis on pop music and The Beatles’ early incarnations. In addition to displaying many incredibly rare artefacts, 'Elvis and Us' also stocks official Elvis Presley memorabilia otherwise only available at Graceland – ideal for gifts. There are even Elvis jumpsuits for the truly dedicated fan. The exhibition has even been visited by Elvis’s co-star in the film The Trouble with Girls Marlyn Mason and James Burton, legendary guitarist from Elvis’s own TCB Band - who backed The King of Rock ‘n’ Roll® in concert between 1969 and 1977. Both have given the exhibition their seal of approval. You can visit the 'Elvis and Us' exhibition at the Pier Head site for just £6.00. HELP! IS ON iTUNES! -- OUT NOW! John, Paul, George and Rio! STOP WORRYING... HELP! IS ON THE WAY ON BLU-RAY! "Photograph" by Ringo Starr - Out Now!